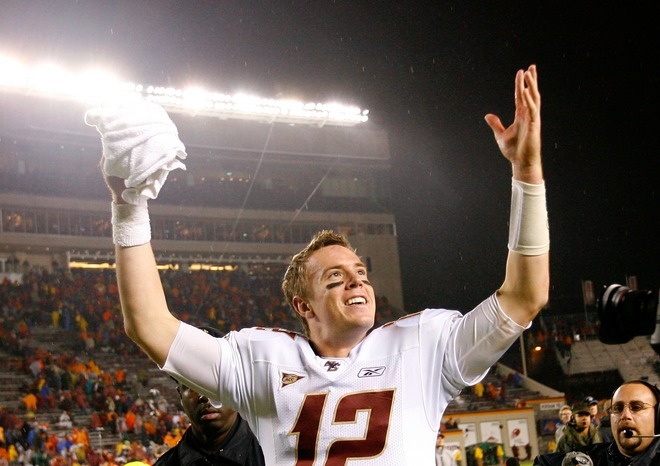 What will Matt Ryan have to do to have his number retired at BC? The two football numbers retired belong to Doug Flutie and Mike Ruth - both who were awarded top flight hardware for season accomplishments, the Heisman and Outland respectively. Men's hoops have not retired any numbers, just jerseys. Hockey has saved the honor only for Dave Emma, Hobey Baker winner. Women's hoops honor Sarah Behn's #33 as she was the first 2,000 point scorer in team history. All of that to say: is there a rhyme and/or a reason to the number retirement? If we go by top flight awards, Luke Kuechly's #40 will be off the board while future QBs fight for the honor of the 1-2 (although, it is currently vacated, perhaps out of respect). However, Ryan's BC career was the epic high point in the last 15 years, and with a little joy needed around the team...would it be an option? What if he wins the Super Bowl or an MVP? Would that be enough?